Oral antihyperglycemic drug – Metformin is one of the most prescribed antidiabetic drugs in the UK, Canada and the USA. For several decades, Metformin is used for the first line therapy in patients with type 2 diabetes. Metformin story is not restricted only by the diabetes treatment. Between 1998 and 2015, the influence of Metformin on weight loss was studied. 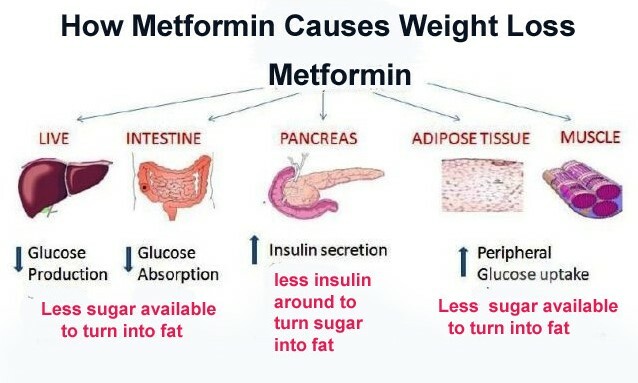 Reliable study results of Metformin and weight loss are published in different biomedical literature, including free science journal PubMed. In addition, reviews about Metformin and weight loss can be found on author’s blogs and online forums (obesity forums as well). A lot of success stories confirming that Metformin and weight loss – it is not a myth, but a reality can be found in the reviews of diabetics. Given the fact that reviews about Metformin are published by anonymous authors; such comments raise reasonable doubts. Almost all researchers, who studied Metformin and weight loss, draw attention to the fact that Metformin has a dose-dependent weight-reducing effect. The higher the dose of Metformin used, the faster body weight is reduced. Herewith, it should be noted that high doses of Metformin could cause severe side effects, as well as abdominal pain, nausea, diarrhea and vomiting. Discussion about Metformin and weight loss is carried out for many years. The lack of conclusive data on the ability of Metformin to provide rapid weight loss does not allow the national health systems (the FDA, Health Canada, MHRA as well) to approve Metformin for the obesity treatment. Herewith, it should be noted that Metformin is not the only antidiabetic drug that can change body weight. After all, in 2014, a new antidiabetic agent – Liraglutide, which is better known under the brand name Victoza, was approved for the obesity treatment. From 2010 to 2014, Liraglutide was prescribed only to diabetic patients to improve glycemic control. In 2014, Liraglutide was approved for weight loss and since 2015, this drug has been supplied at the U.S. market.